First off, if you need to know how to locate the club, check out the Directions Page. That should help whether you are arriving land or sea. 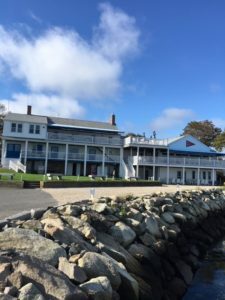 If you are arrive sea, the Plymouth Yacht Club waterfront team will assist visiting yachts in securing a transient mooring for their stay on Cape Cod Bay. It is important to note that RESERVATIONS ARE ACCEPTED (read page the “Reserve A Mooring” page for details). A $65.00 per night fee includes use of the club facilities (Top Side Bar, showers, laundry, launch service, etc.). As mentioned above, follow the channel to the breakwater and hail the Plymouth Yacht Club on VHF Ch. 8 or call 508-747-0473 to request a mooring. The Town of Plymouth was incorporated in 1620. It is the seat of Plymouth County, and has the largest area of any town in the Commonwealth. Plymouth is the oldest town in Massachusetts with a rich colonial history and lots of charm. For most of its existence, Plymouth was an isolated seacoast area where economic fortunes were linked to the sea and shipping. The site of the original 1620 settlement is now a portion of today’s Downtown/Harbor District. In contrast with modern life, Plymouth Rock still more than a landing place, it stands as a symbol of the freedom and a reminder of the first Thanksgiving. Since the arrival of the pilgrims, some 382 years ago, Plymouth has grown from a small settlement into a large community of over 50,000 people, in an area which spans over 100 square miles. There are 365 ponds and lakes, one for every day of the year, a variety of public beaches, a working town wharf, acres of park and recreation land and numerous historic landmarks for residents and tourists alike to visit and enjoy.